Thinking of Greece, you may see sun, heat and a blue sea. You’d never guess that the Greeks were the inventors of central heating; but they built systems where heat from a central fire was transferred via tubes to different spaces, like in the temple of Artemis in Ephesus. Later the Romans used this principle to make floor heating in their houses and other buildings. In Greece it can be pretty cold, and snow not only falls in the north or on mountain tops: many touristic islands can also be surprised by a cover of fluffy snow. This autumn consisted of endless days of summery weather, inviting one to mosey along terraces all day and to take kilometers long walks. But as soon as the sun sets on these beautiful days, even on Lesvos, it is time to crawl inside and settle next to a stove. Adam and Eva did not come into a world with heaters. It was Prometheus who stole the fire from Olympus in order to give it to man to cook and to heat. The oldest ovens (about 20,000 years old) have been discovered in Central Europe. They were simple fire pits in the ground, but apparently working well enough that entire mammoths could be prepared on them. And the bones of those huge animals also served as fuel. The ancient Greeks loved bread and were always keen to improve their baking. They produced clay ovens; around 7000 BC flat breads came out of them and, sprinkled with herbs, onions and garlic, they might have been the first pizzas. On the Cycladic islands a portable clay oven from the 17th century BC has been found. It was the Romans who started to build stone ovens. In the volcanic ash covered city of Pompeij they found at least 30 stone ovens. They were the precursers of the outdoor oven, still seen in many Greek houses and used during festivity days to prepare large traditional dishes with meat and vegetables. Greeks still like to play with fire. 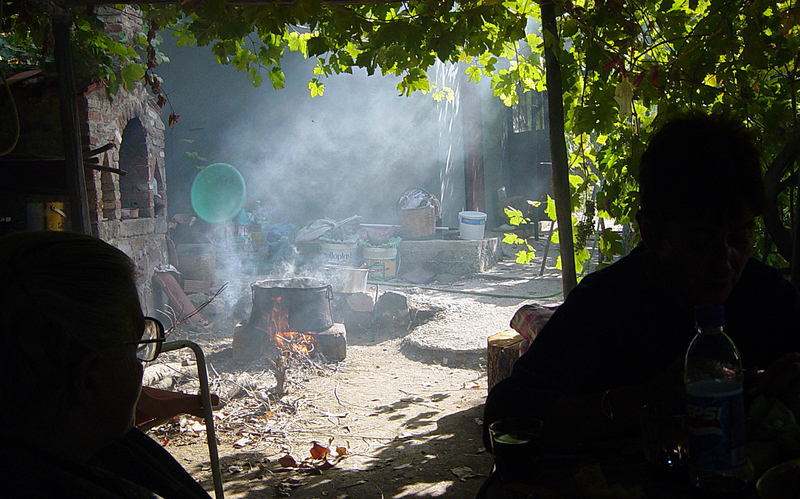 Making home beverages like tsipouro, cooking figs or grapes into a syrup, it’s still happening on an open fire, even though these domestic crafts are slowly dying out. As is preparing a meal in the outside oven. Now you only find cooking plates fired by gas or electricity in the kitchens. But the fire keeps on burning, though not always to prepare food. Many houses still have an open fireplace (tzaki), although more to satisfy a romantic soul than to produce heat. Households with central heating are still a minority. Not many people can afford the high price of oil fuel since this long lasting crisis. Commerce in wood stoves (zomba) has been stoked up enormously, causing in the big cities like Athens smog alerts. Many poor families are using old windows or furniture as fuel. It seems that Lesvorians, just like tourists, think they live in a country of only sun, heat and blue sea. Window frames are only made to keep up the glass, doors to keep people inside or out; wind and rain are on the guest list and can always pass through. The houses seem to be made for an island of year-round summer. Which is not the case. In autumn a certain chill will creep into the stone houses, especially after the first rains and when temperatures drop to under 20 oC. When the winter approaches (they say that in Greece the real winter only starts in January) you cannot sit quietly for more than a few moments without getting chilled to the bone. To make yourself comfortable there are stinking oil fuel stoves, small electric big-spenders or wood stoves. Open fire places might also chase the first colds, but when the real winter enters, an entire forest of trees will not warm your house; the efficiency of an open fire is very low. The best solution is a wood stove, that can heat an entire house (especially when the stove pipe wanders through half the rooms). I started out with an open fire place, in two of the coldest Lesvorian winters of this century: snow, ice, rain and storms kept on attacking the island for months. I practically lived ín the open fireplace because my house was a first class air vent, even though the window sills were covered with towels in order to save the house from flooding. Now next to me is the satisfying sound of a purring wood stove, behind new windows and doors that are made for what they are meant. The nice thing about my wood stove is that it has an oven: excellent to make pizzas, bread and other oven dishes. On top of the oven there is always hot water for a tea or a coffee. I am wondering why there are so many wood stoves without an oven. Such a lost of energy! Wood stoves were originally made for cooking, just like fire was given to the people to cook. A wood stove does not have a button you can press and ‘oppah’ the flames spring up. The ash drawer has to be emptied, the glass window must be cleaned (with ash), kindling has to be gathered and a woodpile has to be built. Then you may set the fire. And then you have to maintain the fire, a rhythm you will soon make your own. And of course you have to chop wood and transport the wood to your house. I bet keeping a wood stove requires as many sporty moves as a fitness lesson: chopping, toting, getting down, getting up, cleaning, you do it all and for free. I used to dream of having an AGA cooker. That dream has been fulfilled, even though it is with a Bulgarian Prity that – for just a small fraction of the price of an AGA – produces as many delicious dishes and also warms the house. For the open fireplace there also is a solution of installing a closed oven in it, sometimes with tubes attached that can bring the warmth elsewhere in the house. And so the wheel again has been invented (Dutch expression). With the crackling flames fighting the moisture and cold in the house and with spring still faraway, and with the scent of a leg of a lamb covered in honey and herbs filling the house, in silence I thank Prometheus for the divine gift of fire. If I had a fireplace in my office, it would be lit all winter. Thanks for reminding me to give thanks to Prometheus for the gift of fire. And thanks to you for a heartwarming essay! Nicely written, but how cold is it that you have to use the fireplace?